It is simple to order online, click the ‘Add to cart’ button for the quantity you wish to order. 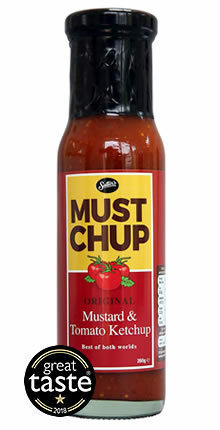 We know once you try MUST CHUP you’ll quickly be running out! So make use of our fantastic offer, every 3rd bottle is on us. Just don’t forget; delivery costs apply. Delivery costs start from £2.20. 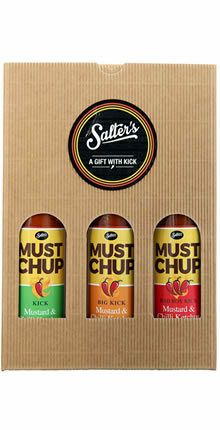 The Must Chup 2 bottle gift box is an excellent present for serious Chilli Lovers and people who like a 'kick'. It's a great way to sample our products. 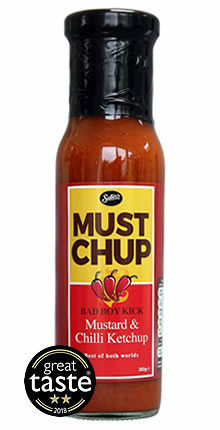 2 of our extra spicy products - Must Chup Big Kick and Bad Boy Kick in a Gift Box. 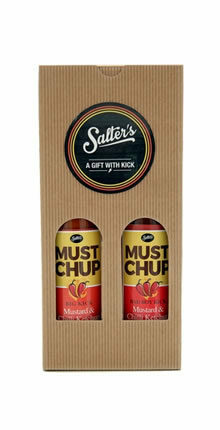 The Must Chup 2 bottle gift box is an excellent present for anyone. Suitable for Chilli Lovers and people who like a 'kick'. It's a great way to sample our products. 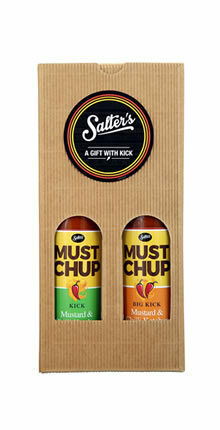 2 of our spicy products - Must Chup Kick and Big Kick in a Gift Box. An excellent present for anyone. 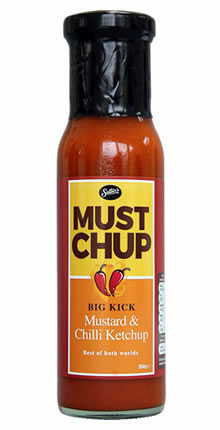 Suitable for Chilli Lovers and those who like a 'kick'. 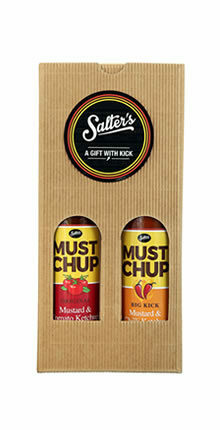 3 of our products - Must Chup Original, Kick and Big Kick in a Gift Box. 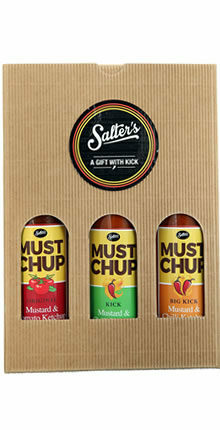 The Must Chup gift box is an excellent present for Chilli Lovers and people who like an extra 'kick'. It's a great way to sample our products. 3 of our products, Must Chup Kick, Big Kick and Bad Boy Kick in a Gift Box. The perfect way to enjoy our complete range and a real family favourite catering for all tastes. Enjoy the 'Original' for the Kids and Non Chilli lovers to the 'Kick', 'Big Kick' and 'Bad Boy Kick' for the Chilli Novice to the Chilli Lover! Enjoy! 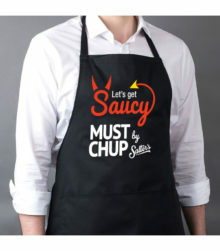 Our new "Let's Get Saucy" apron. The perfect gift for those who love to cook! Premium black apron made from 100% cotton embroidered with Must Chup strap line and logo. Only available from our website. Ideal for a chilli lover at any time of the year.